One of the sources of motivation for the expansive conception of ecology is reflection on the domain of systems ecology. Systems ecologists use a variety of formal techniques - network theory, information theory, dynamical systems theory, etc. - to describe the structural and dynamical properties of whole ecosystems. But why should systems ecology be associated with the expansive conception of ecology? Is systems ecology not commonly viewed as a branch of traditional ecosystem ecology? 3. properties of the 'relations' that obtain 'between' biological entities and their environments. Different research traditions in ecology can be distinguished in part by which of these three categories of ecological phenomena are the main focus of study. Population and community ecology, for example, are organism-centered branches of ecological science that focus on phenomena of type (1). The magnitude and rate of change of properties like population size and density and community composition all depend in various ways on the relationships that the component populations have to their biotic and abiotic environments. 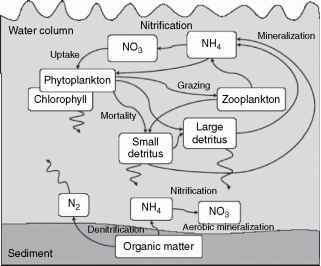 Empirically oriented forms of ecosystem ecology (i.e., biogeochemistry and ecological stoichiometry) tend to focus on phenomena of type (2) involving stocks and flows of biologically relevant elements, nutrients, and minerals. For example, the standing stock of phosphorus in a lake ecosystem is a property of the environment of the lake's biotic community, but its properties depend in part on the biotic activities of this community. Systems ecology, by contrast, focuses on phenomena of type (3). The nodes of an abstractly defined ecological network are meant to correspond to functionally defined ecological types (predators, filter feeders, deposited detritus, microbiota, etc. ), but for the most part the phenomena of interest to systems ecologists are the 'network' or 'organizational' properties of such systems (e.g., connectance, cycling indices, throughputs, and other measures of network structure and function). Systems ecologists are perhaps better described as 'complex systems' ecologists; they seek to describe and explain macro-level patterns in the structure and behavior of ecosystems - patterns, for example, associated with self-organizing processes - that may be characteristic of certain generic classes of complex systems. 1. The details of the system (those details that would feature in a complete causal-mechanical explanation of the system's behavior) are largely irrelevant for describing the behavior of interest. 2. Many different systems with completely different 'micro' details will exhibit identical behavior. What do fluids, chemical systems, electrical circuits, lasers, and acoustic systems have in common that would explain their common period-doubling route to chaotic dynamics? Whatever it is, it cannot have much to do with the specific material properties of the components that make up these systems. Any explanation must refer to the relational or structural features that the systems have in common - in short, it must abstract away from the 'matter' to identify the underlying 'form' that is common to all the systems in question. Theoretical systems ecology looks to discover properties of this type that describe ecological systems, but due to their formal character, they may equally describe properties of neural networks in the brain or human socioeconomic networks. It should not be surprising, then, that systems ecologists have a tendency to speculate on the implications of their work for phenomena in other branches of natural and social science. • What precisely does it mean to say that a real-world ecosystem instantiates or exemplifies the organizational properties of a formal ecosystem model? • How do we know when a real-world system actually instantiates a particular formal model? How can such claims be tested? What evidence would bear on them? • How do the formal properties of ecological systems (the properties that might be instantiated in many different kinds of systems) interact with the material properties of ecological systems (the properties that are particular to the material constitution of the system in question), to generate observed structural and behavioral patterns? • Does the existence of formal properties of ecosystems demand a holistic view of ecosystems, or is it compatible with a reductionistic view whereby the properties of the whole are determined by the properties of the component parts?